I wanted to write this post to highlight and warn people currently looking for solar roof ventilators. In your quest for finding a roof ventilation system you will come across a variety of units which may or may not be suitable for your home. This could be for a number of reasons, however one of the main reasons and the most untold is that many companies sell American designed roof ventilators, designed for American roofs (shingles) which are very difficult to install on Australian roofs. It’s very frustrating when you look for (or even purchase) a roof ventilator from a major home improvement retailer which then turns out to be designed for the wrong market. So when you’re looking for a roof ventilation unit, here’s a few questions you should ask the retailer before you make the purchase. What type of flashing is supplied with the product you are considering to purchase? 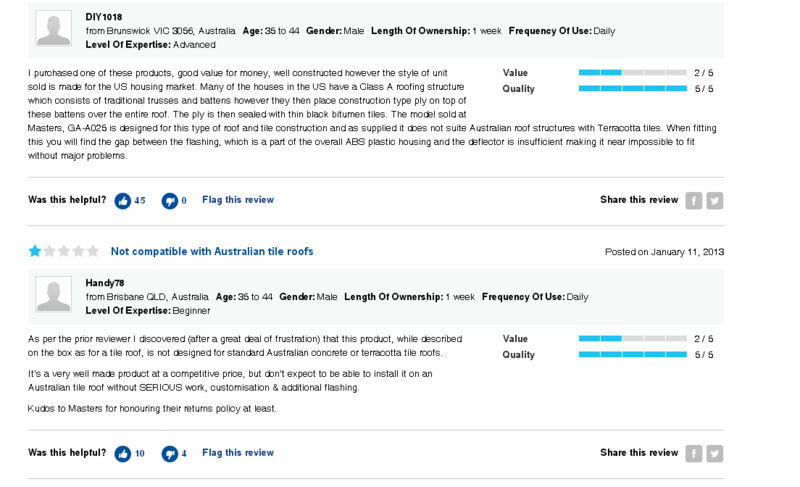 Is your roof ventilator designed for Australian roofs? How long does it take to install your roof ventilation unit on a [insert roof type]? Is the product suitable for DIY or do I need to hire one of your installers/dealers to install the unit? Common issues faced are when someone decides to install a unit which may not be designed in Australia (the unit being built overseas is generally OK as it keeps costs down for you as a consumer). The best workaround for a roof ventilator designed overseas is if the seller offers a custom solution for installing the unit on your specific type of roof. The second best option will be to have your installer adapt the originally supplied flashing to suit your roof. However, this will normally be associated with significant additional installation cost as the installation will take a very long time to complete. Also, be aware that american designed units are not only difficult to install but that the steel flashings normally supplied with these units may cause severe damage to your metal roof due to galvanic corrosion caused by electrolysis. So when doing your research – make sure you’re getting the flashing you need – i.e. either a customized flashing specifically for your roof or an adaptable roof flashing included in the price before committing to purchasing your roof ventilation unit. Pretty much all Whirlybird type roof ventilators in Australia are supplied with flexible aluminium flashing and are easy to install and to our knowledge at least two solar ventilators are supplied with flashing appropriate for Australian roofs. This post discusses these two include the Solar Whiz and Solar Star (flexible aluminium). When making a decision to choose a ventilation alternative fit for your home whether it be residential or commercial – be sure to check if the roof vent is fit for Aussie roofs! We also have a roof ventilation alternatives chart which you can use to weigh up the best ventilators in the market.